We have been enjoying the God's Design For...series from Answers In Genesis. Including both physical and biological sciences, the series is designed for elementary through middle school but seems to me most well-suited for middle school. 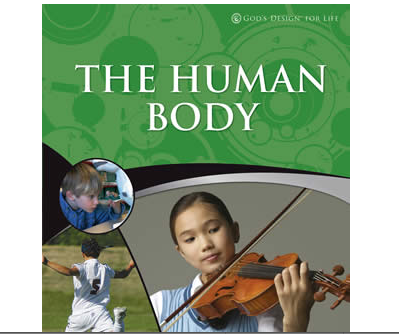 The Human Body book of the series is in full-color and studies the body by system. It also includes lots of fun and interesting facts about the body. And importantly for us, it covers all material tastefully and from a creationist perspective. It is available from the Answers In Genesis website.